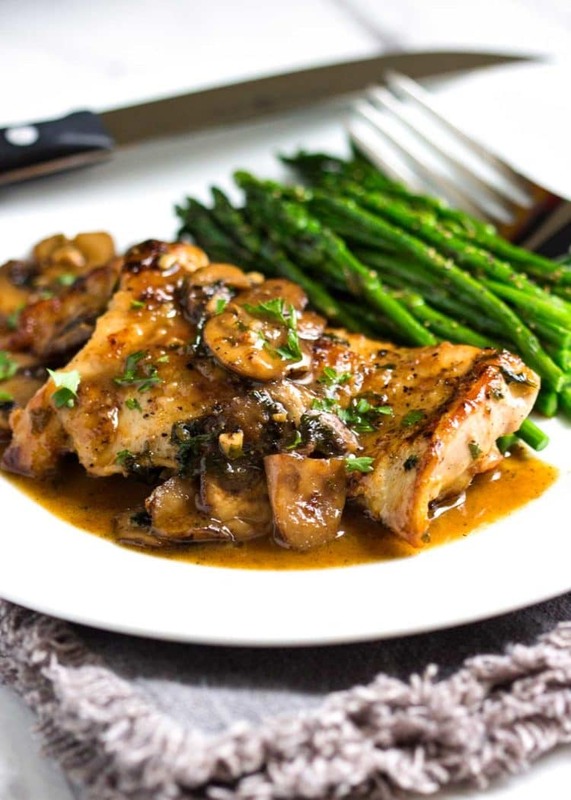 Chicken thighs are always on hand for meals that need to happen quickly and this Pan Seared Chicken with Mushrooms is a great example of that. Watch the new video to see how easy it is to make, too. 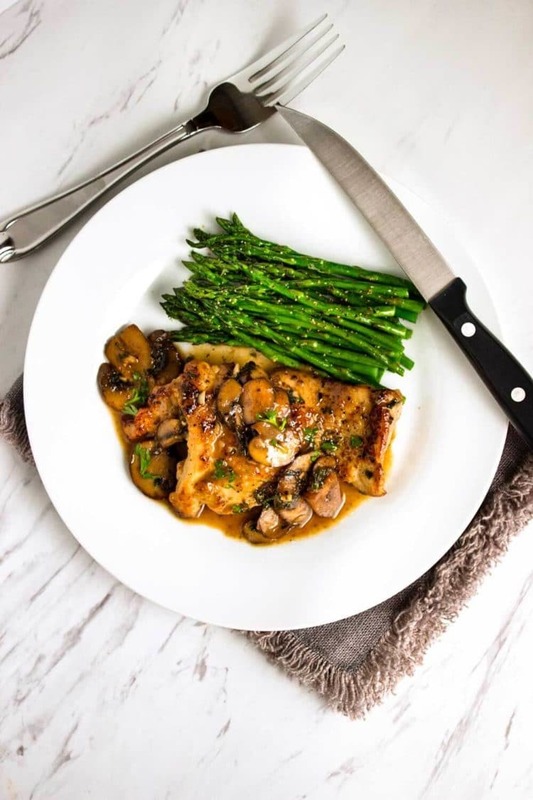 These healthy, flavorful and tender chicken thighs are boneless and skinless, get a quick pan sear then are napped with an incredible mushroom sauce that seals the deal. Happy Monday people. Everyone have a good weekend? Did you watch the Oscars and did your favorites win? I have had this evil flu that’s been going around and it hit this house hard. Been down and out for the past week, it’s terrible. 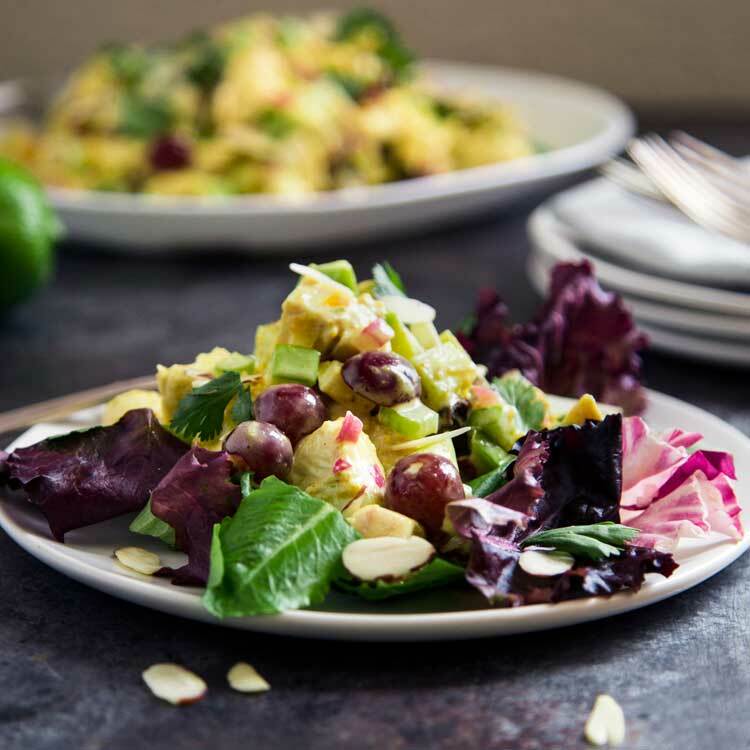 Needless to say I thought this favorite of mine would help make your mid-week dinner plans easier. It did mine last night! 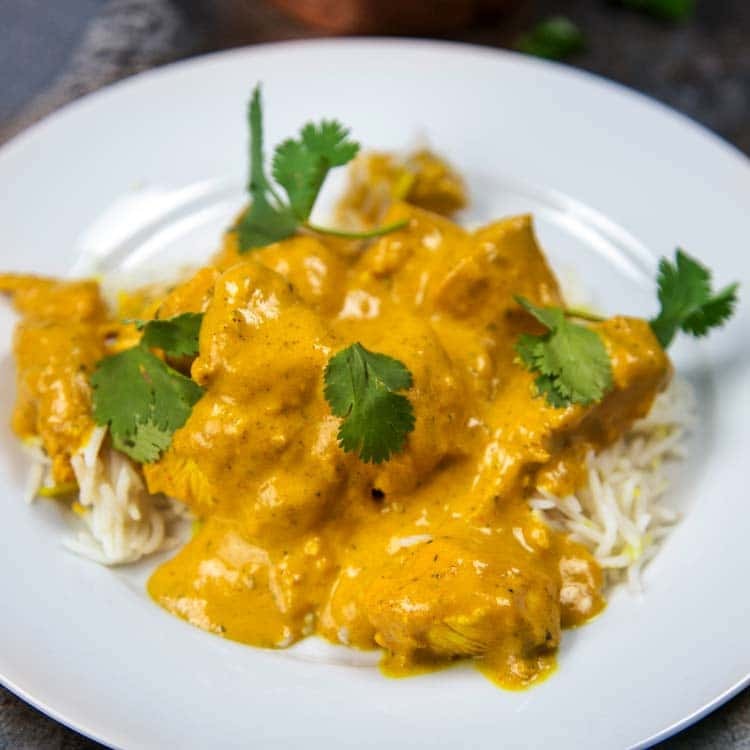 I have been testing and re-testing recipes, baking like a mad man and trying new things for upcoming recipe posts and videos and sometimes a good, easy and tasty meal is all I need to end the day right. San Diego has been actually having rain lately, amazing right? It is for us, where the one season is sunny. California needs rain, so I am happy it continues to make a dent in the drought. We even took the boys out Sunday morning to run and play on a hike and it started to rain. Loved. Every. Moment. 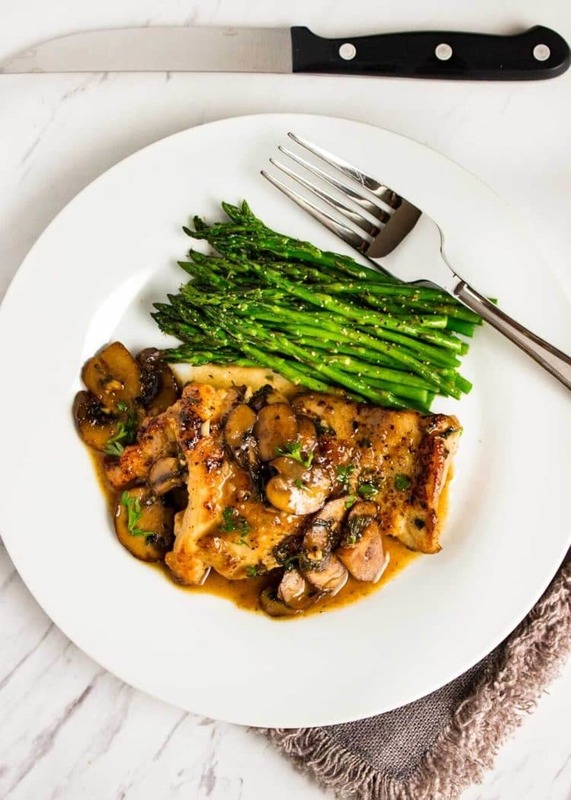 This Pan Seared Chicken with Mushrooms has a wonderful pan sauce that has lots of mushrooms all sautéed, simmered and ready to be devoured in minutes. Seasoning the chicken, pan searing, and then making the sauce and those chicken thighs go back in to coat and plate up. Easy peasy. A little side of steamed vegetable, which happened to be some asparagus, and dinner was done. Hope this helps for a quick and tasty dinner. Enjoy! 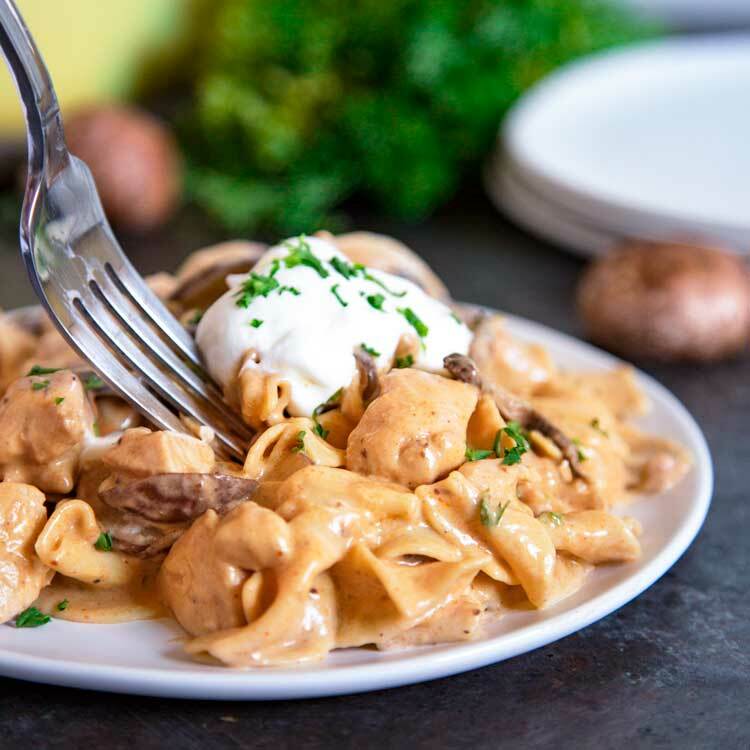 If you like this Pan Seared Chicken with Mushrooms try my Five Spice Roasted Chicken Thighs, Three Cheese Potato Bake or my Chicken Tortellini Dijon Alfredo. 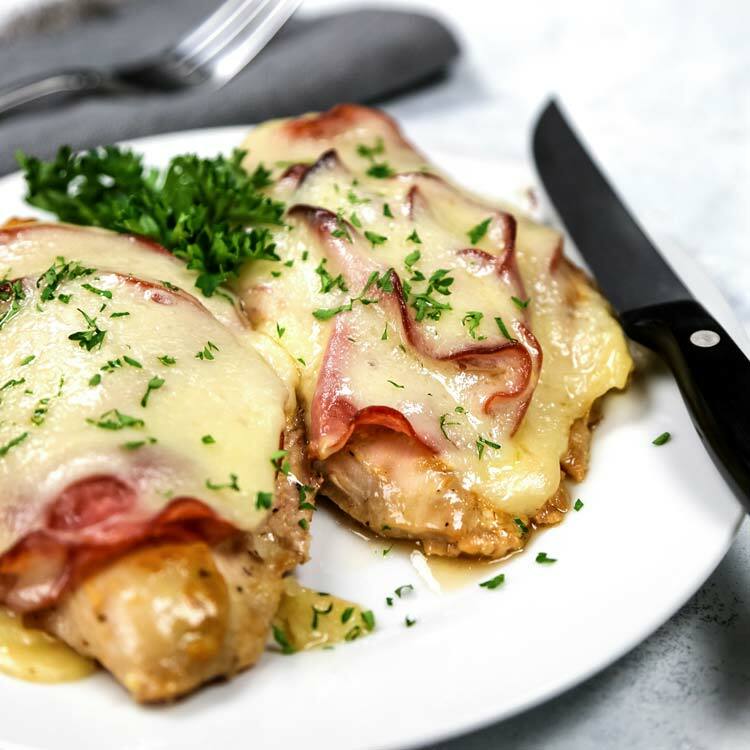 This recipe first appeared here on Kevin Is Cooking on September 16, 2016 and has been updated with a new video. Hope you enjoy it. 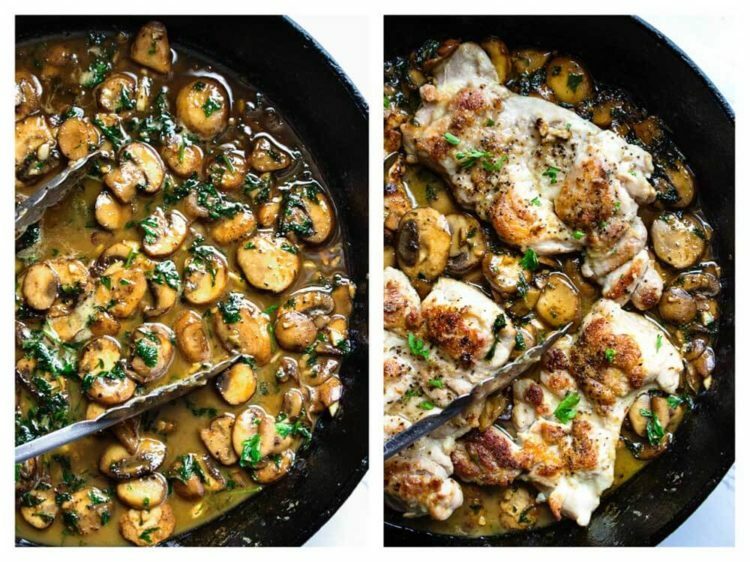 This Quick Pan Seared Chicken with Mushrooms uses chicken thighs, is smothered in a luscious, lemony mushroom pan sauce and is on the table in 30 minutes. 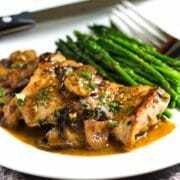 Adapted from Sunset magazine recipe Chicken Scaloppine with Mushrooms. In a large skillet over medium-high heat, melt 1 tablespoon butter. Add mushrooms, lemon zest, and lemon juice. Cover and simmer 5 minutes. Uncover and cook over high heat until liquid almost evaporates and mushrooms brown and glaze, about 5 minutes. Add white wine, 1/4 cup broth. Stir to scrape up browned bits in pan. Pour into a small bowl. On a plate sprinkle both sides of chicken thighs with salt, pepper and flour. Add 2 tablespoons of butter to skillet and melt over high heat. Add chicken to pan and cook until lightly browned, 4 minutes. Turn over and cook for 6 minutes. Remove to platter, cover to keep warm. Pour cooked mushrooms back into pan and add remaining 1/4 cup chicken broth, 1/4 cup parsley. scraping to release brown bits on bottom of pan. Add remaining 1 tablespoon butter and swirl in pan until melted. 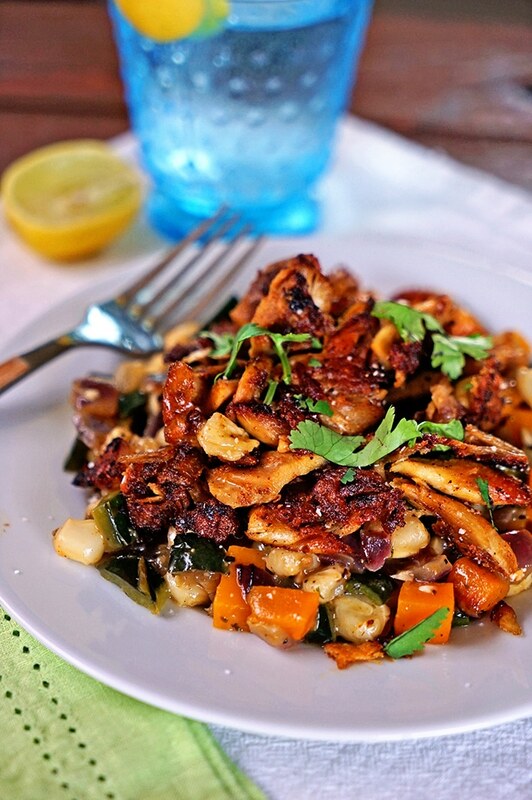 Drain juice from cooked chicken into pan. Bring to a boil, stirring. 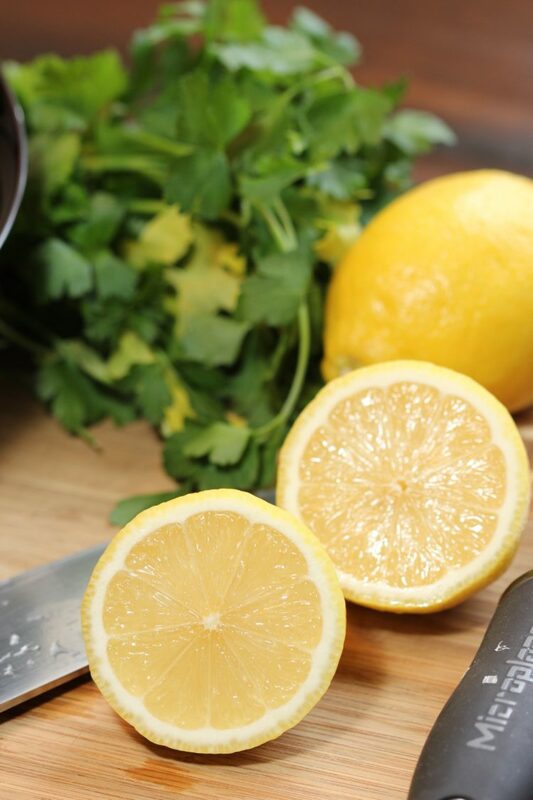 Pour over chicken and sprinkle with ­remaining parsley. 1. I use 4 boneless and skinless chicken thighs weighed in about 1 1/2 pounds total. Pound meat with a flat-surface mallet until about 1/4 in. thick. I loveeee this recipe. My husband has made it at my request at least 4 times. Tonight it’s my turn! Good Googlie Mooglie! This is amazing! 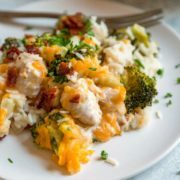 Served with mashed potatoes and mixed vegetables. Next time I will double the sauce. So delicious! 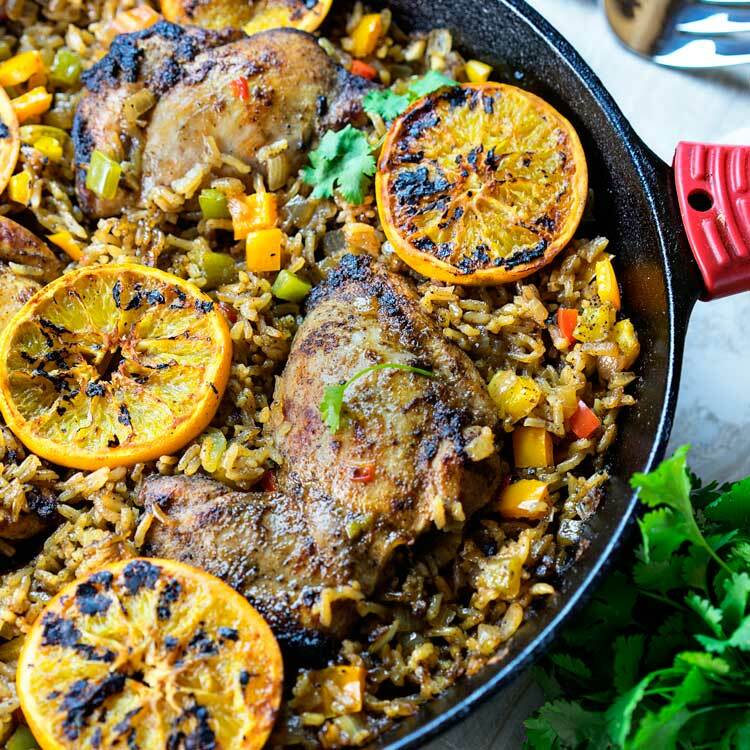 I made this for dinner tonight and it was delicious! I butterflied the chicken and it cooked perfectly with 4 minutes on the first side and five on the other. I served it with mashed cauliflower, brussel sprouts, and asparagus. Man, that sounds so good right now Robyn. Thanks for the reminder! This is the first time cooking this dish (ever!) and it was truly amazing and very delicious! I will save to make it over and over again as a specialty dish. I used chicken breast because that is what I had on hand; didn’t have red wine or chicken broth, so I substituted Rum; and didn’t have parsley and still very very delicious! Thank you Kevin! Now that sounds tasty, liked your improv ideas Suzanne! I made this last night for my very picky husband, and picky sons. They all really liked it. I will definitely be making this again. I made this tonight! Yum, yum, 😋. Easy. Quick. DEE-LISH-OUS!!! 10 minutes total cook time for chicken?